Bethel Berry Cemetery is located near the Bethel Berry Church of Christ in north/northwestern Lauderdale County, Alabama. The church was established on June 21, 1868. 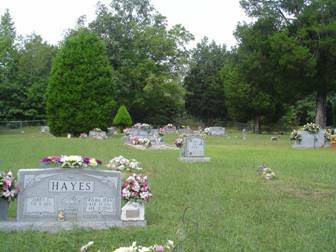 This cemetery has a large number of unmarked graves compared to its size. It contains about 24 interments with only rocks marking them. To reach Bethel Berry Cemetery, from Florence, Alabama, travel north on Alabama Hwy. 157 to Cloverdale. Turn right on County Road # 8 and travel about ¾ mile. Turn left onto CO. Rd. 139 and travel about 3 miles. The cemetery is on the right side of the road among trees about .1 of a mile before reaching the church. Farrow, Ruben; b. 29 Sep 1823, d. 27 Jul 1883, husband of Martha A.
Holt, Betty (Valentine); b. 25 May 1942, d. 26 Jan 2009, wife of Raymond D.
Johnson, Elizabeth F.; b. 20 Aug 1945, wife of Arthur T.
Johnson, Willie Tee; b. 16 Mar 1916, . Jones, Samuel Houston; b. 03 Jul 1887, d. 13 Apr 1975, husband of Mamie V.
King, Doris D.; b. 27 Sep 1943, d. 22 Jun 2008, wife of Bobby Clay Sr.
Marks, Cecil J.; b. 20 May 1916, d. 23 Jan 2000, husband of Nettie D.
Marks, Rufus W.; b. 26 Feb 1894, d. 19 Dec 1960, husband of Emma J.
Perez, Cathy A. (Marks); b. 07 May 1949, only date, wife of Ruben A.
Spires, Nancy L. (Raines); b. 06 Jan 1853, d. 05 Mar 1934, wife of James A.
Valentine, Wylodean M; b. 05 Jan 1918, d. 11 Apr 2004 wife of Jesse M.
Wesson, Lora R.(Jones); b. 14 Apr 1921, d. 07 Sep 2004, wife of Sam P.
Wesson, Sam P.; b. 26 Aug 1916, d. 04 Jan 1981, Pfc. US Army WWII, husband of Lora R.
Whitten, J. Harper; b. 15 Jun 1889, d. 16 Nov 1965, husband of Virginia N.
Two stones with letters V E P Names unknown.